Why would I want to share our family room? Well, some of us are just curious. We like to see how others live. Some of us are looking for ideas and inspirations for our own living spaces. But mostly, there's this one wall in particular, that I want to share, and think someone out there might be able to use this idea. And I have to say, most importantly, this was an easy project for amateurs, with zippo carpentry skills. An yet it gives the room "mood". I'll start with this accent wall. This room was part of a kitchen remodel in 2008. We had an open floor plan with the kitchen, casual dining and family room, previously. We wanted a separate family room from kitchen, with eat-in area in the kitchen. So, we added a wall, separating the kitchen/eating area from the family room. The wall was erected where a visible, heavy ceiling beam supports the attic above. It seemed to be a natural dividing line between the kitchen and new family room. In building this wall, we found some oddities, which needed camouflaging. 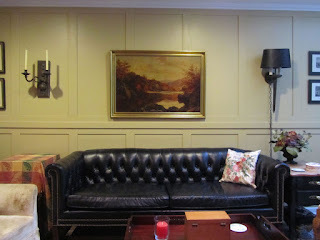 So, it seemed the quickest option was to lay plain, very thin, mahogany panels, on the family room side of the wall. We hired someone to actually frame the wall and lay sheetrock on for us. (Like I said, no carpentry skills whatsoever, and we didn't want this wall, umm, leaning, when a wall probably shouldn't lean.) And he nailed up the mahogany luan paneling (he had tools, we didn't). Mahogany luan is typically very thin, and very smooth, but could have imperfections, so it is primarily used where it will be painted. Also, it's very inexpensive. Our local lumber store sells it for about $20 per 4-foot by 8-foot by 2.7 mm (about 1/10-inch) thick sheet. This type of very thin panel is designed to lay flat against another smooth surface (like sheetrock). While we did this pseudo wainscoting on the smooth paneling (to camouflage some issues in the wall underneath), this project could also be done on smooth-finished sheetrock. We used the plain, 5/8-inch thick, MDF trim as a chair rail, the whole length of the wall, the 3.75-inch wide birch trim as vertical stiles, and the 2/5-inch wide birch trim as the horizontal base and top stile. The coved corner moulding "finished" the ends of the wall and transitioned into plain drywall. Our total cost (not including primer/paint) was under $150, for a wall about 20-feet long and almost 7.5 feet high, or about 150 square feet. The luan paneling (only necessary to cover some wall problems) added about $100 in materials-cost. So, without luan, about $1 per square foot, or $1.66 per square foot with luan cost. Prefab wainscoting averages about $7 per square foot, for materials only (not labor). For 150 square feet of wall, that would have cost about $1000. My husband and I worked on this wall, 2 Saturdays in a row, about 4 hours each day, for a total of 16 man hours. If we had known what we were doing (neither of us had a clue when we began, and wasted a lot of time trying to figure things out), we could have done this in about 6 hours, working together. As it was, for a savings of about $750, divided by 16 man hours, that's an "earnings" of about $46/per hour. 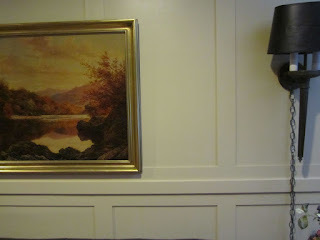 We had already installed the crown and baseboard moulding, prior to this work. The mahogany panels left seams every 4 feet. These seams became our design-starting point. Dividing the wall in half, horizontally, we worked on the upper half first. We used the 3.75-inch birch to cover the seams between mahogany panels, from the crown moulding down. After covering the seams, every 4 feet, we added an additional vertical stile, in between every seam-covering stile. So, our finished vertical stiles are 24 inches apart, center to center. After the upper vertical stiles were in place, we placed the MDF chair rail, just below the bottom of the birch stiles. Once the chair rail was installed, we added the 2.5-inch birch strips, cut to fit, as horizontal stiles, at the top and bottom of each panel (just below the crown moulding, and just above the chair rail). With the upper section of the wall finished, we duplicated this work, below the chair rail, cutting the birch pieces to fit. Ends of the wall were finished with by dead-ending the horizontal stiles against a piece of vertical cove corner moulding. 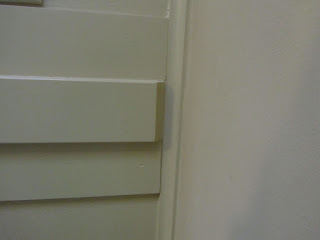 A mitered cut was made on the chair rail ends, up against the adjacent walls. After caulking and filling nail holes, we painted the entire wall in the same color as the rest of the room (Cookie Dough by Glidden). Above the fireplace we did a similar trim. 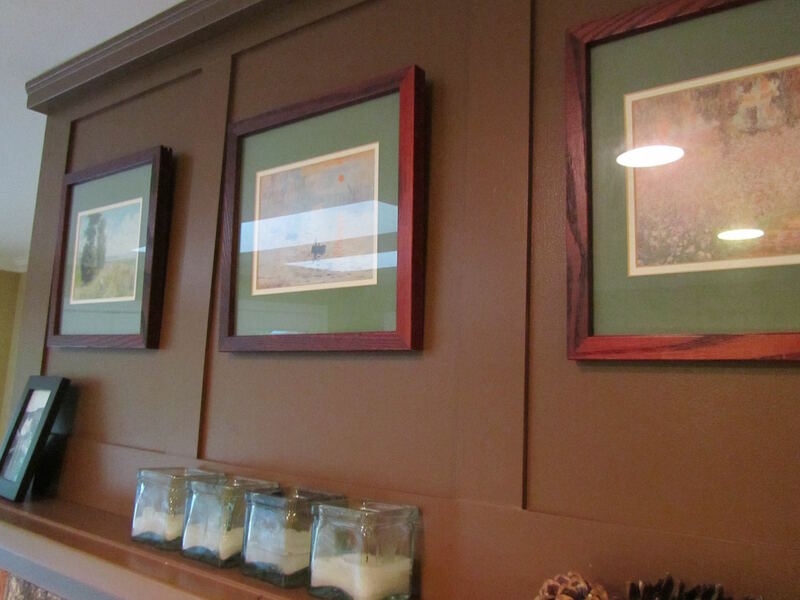 The above mantel area was covered with plain panels, then we added the birch strips for accent, and painted all. The mood we were trying to set with this room is cozy English country hunting lodge or rural farmhouse, if that's possible. This room is most used in the late fall through winter. It's the room with a television, so we watch videos on those cold winter evenings, for home entertainment. The wall color is darker than the living room. It's meant to wrap you up in warmth, like an extra blanket on a chilly night. We duplicated this idea in our entry hall, on the wall below the stairs. 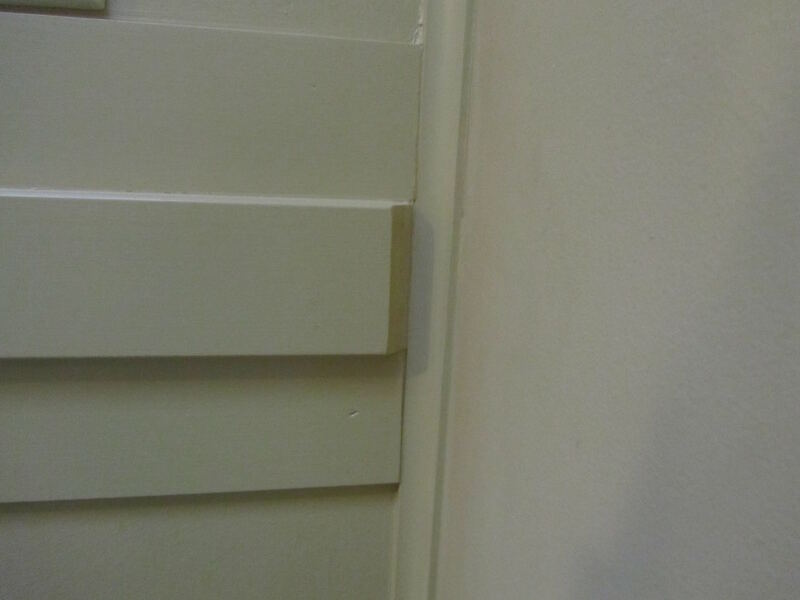 This area is painted in white, and only on the lower part of the wall. There's a bedroom in which I'm wanting to do this same sort of wall treatment. I'll update you if/when that ever happens. Looks very nice! Cozy and comfortable...good job! I think your wall finish looks every bit as beautiful and a lot cheaper than prefab wainscotting. Very ingenious to use luan sheets which are also cheaper than the thinnest plywood. It is not easy to finish drywall perfectly either, so your solution may have saved time as well. You did well using a mitre box, instead of buying a hundred dollar mitre saw to cut all those strips. I think you and your husband did the wall in record time. It is not unusual to rethink as you go along, and find a better way than originally planned. It is also pretty tricky to prime and paint those strips. 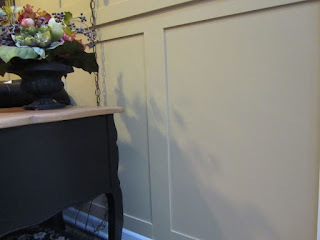 Did you plan on using a cove molding at the end, not too familiar with wainscotting techniques? Also to do the same work throughout your house as an accent really makes this finish architectural IMHO. I love your sense of color and decor. Fabulous job, and frugal too!! the luan panels were dead-ended into the drywall finish adjacent, and not terribly even (due to the nature of the finish on the drywall). So something had to go in the corner, and the coved moulding was the least intrusive, and probably the cheapest of all of our options. I'm just curious, do you know what luan is usually used for? We opted for them, at the suggestion of the guy who built the wall, because they were so thin, (wouldn't add to the wall thickness), and they had a smooth, wood finish (which looks more like painted wood paneling than drywall). Thanks. It's not perfect, but we're okay with that. I always assumed it was to finish doors since the size is usually less than a standard 4x8. The ones we used were sold at Home Depot for a lot less than $20 a sheet, so maybe those were different. But the product was called "luan" as well. We got ours at a local lumber and hardware, and was listed as 4x8 mahogany luan 2.7 mm (about 1/10th inch thick). It was so thin it was like a door skin. Maybe the same thing? Maybe not? I looked up what luan is used for, and one site said it was often used in making doll houses. We always have defects when we do construction, sometimes instead of recutting the lumber, I do a Bondo and sparkle fix. I fill first with Bondo (automotive grade is OK), grate/sand it down to level after about 30 minutes, then swipe over with spackle, let dry and sand. I fill large corner gaps with spackle first then follow with a bead of caulking (filling with spackle first seems to prevent the caulk from cracking). We built our kitchen wall with leftover scraps of drywall from our jobs, with lots of Bondo and spackle fill, can't tell that it wasn't whole sheets. I'm thinking, unless the cove molding is part of the design, maybe cheaper and easier to just fill the defect primarily with Bondo. I like it because it dries in minutes for repeat application. Not sure if climate/temperature is a factor for using Bondo on wood. I think it looks beautiful! I also love seeing others' homes - we can learn so much from each other. Thanks for sharing! I think you're right, we can be a tremendous resource of ideas for one another. I've seen similar ideas on other blogs and have always admired it--looks very dressy. When we renovated our kitchen, we used beaded board paneling as a backsplash--I needed something affordable to dress up the area and hide some wall imperfections. I love it and would like to do something similar in my back entry area. Thanks for sharing your picture with us! We did bead board in our kitchen, too, on the lower part of the walls. I'd like to add it to the laundry room and adjacent powder room. Maybe some day. . . So pretty! I love the look of it. My sister did something similar in her living room. It makes it look more elegant than it was before with a plainer wall. Great idea and looks great too. I have to ask why you wanted a separate family room. Most people seem to prefer having the open concept where the kitchen is open to the family room. That way whoever is working in the kitchen can still be part of the group in the family room. Was it to give the cocoon feeling? Just curious.